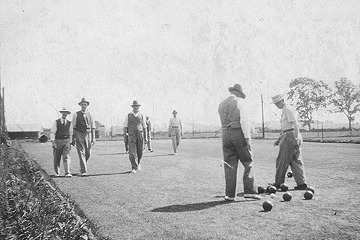 In the mid 1930’s some residents of Highworth, most of whom were businessmen, were keen to find a site where bowls could be played; and if a search proved successful, to form a bowls club. As a result of enquiries it transpired that the Parish Council would be willing to allow the use of a piece of land in the recreation ground, in the area now laid down as tennis courts. In consequence, a meeting was called for July 6th 1936 in the Vicarage Church Room, under the chairmanship of the Rev. F. R. Webb, then Vicar of Highworth, to discuss the possibility of forming a bowls club. It was decided to accept the offer from the Parish Council, and a proposal to form a bowls club was proposed, seconded and agreed. The annual subscription was fixed at five shillings. Arrangements for playing bowls now moved apace. The piece of ground in the recreation field was given some preliminary levelling and three rinks were laid out. The green was opened for practice on July 27th 1936, just three weeks after the date of the exploratory meeting. A fee of one pound for the use of the green for the season was agreed with the Parish Council, and the newly formed Club settled on a fee of one penny per player per game. To put membership on a formal basis, it was decided that potential new members should be proposed and seconded by existing club members, and their names brought forward for election at the next general meeting. At the first general meeting held in January 1937, the Rev. F. R. Webb was elected Chairman, Mr. F. Higgs Treasurer, and a greens committee was appointed, comprising Messrs. E. Drew, J. A. Haggett, H. Williams, G. Cook, W. Boulton, F. Woolford and a Mr. Cox. It was agreed that ladies should be admitted as club members (but not, as yet, as playing members). Indeed, it was not until 1955 that ladies were admitted as active playing members of the club. Before the start of the bowling season in 1938, the club purchased six pairs of woods, at a total cost of 3 pounds. 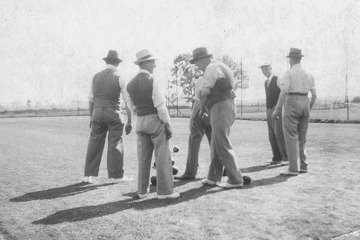 The club decided to charge one penny for the use of a pair of woods and one penny for the use of the green per session. By this time, Fred Mulcock, a near foundation member who remained an active bowling member until well into his eighties, and continued as a Life Member until his death in 1994, had become a member of the committee. In this year Mr J. Masters, of Hampton Lodge, became President and retained this position until 1948. The Council was responsible for the maintenance of the green but it would be wrong to suppose that everything went smoothly. As early as 1938 a letter was sent to the Parish Council complaining about the way in which the green was being maintained and mentioning the possibility of the Club acquiring a site and constructing its own green elsewhere. The club itself invited tenders for re-turfing or sowing grass to improve the green but the cost proved to be beyond the club’s resources. The state of the green did not appear to be due to any failure on the part of the greenkeeper, Mr. J. Smith, for the club registered appreciation of his services in the Club minutes and elected him an honorary member. But some members were sufficiently dissatisfied to persuade them to leave and join the Stratton Churchways club. However, those players must have known from the outset that a green carved out of the recreation ground could not be expected to match up to the standards normally associated with a purpose laid bowling green. Correspondence continued to flow from the club to the Parish Council during the following years on the state of the green, without the club obtaining much satisfaction. The Club, for its part, remained on the look out for a site on which to construct its own private green. Among the sites considered was that now occupied by the town library; another, a piece of land in the brick kiln allotments. The President, Mr. Masters, offered the club an area of land on which to construct a green but the club felt the site was too far out of town. Matters concerned with acquiring a site for a new green remained relatively quiet during the war years. Mr Smith continued to provide good service on an inadequate green; during 1942 the club paid him 5 shillings a week to maintain the green from 1st May to 30th September – a sum that seems pitifully small nowadays but was no doubt very welcome to him at the time. That he did the job well is evidenced by the fact that later the club added a gratuity of 10 shillings in appreciation of his services. Then came the end of the war and conditions slowly returned to normal. The value of money had changed and in 1947 the Parish Council offered to spend 25 pounds on the green provided the club continued to rent it for the seasons 1947 and 1948. It was in 1949 that a decision was finally taken to go ahead with the acquisition of a suitable site on which to construct a new green. But if this was to be done funds would be needed. A fund-raising committee was formed and the entrance fee raised to £1.1s. Around this time Mr. Clack offered the club a piece of land on the Swindon Road large enough to lay a 40 by 40 green, with space for a club house, at a price of £210, the whole to remain on mortgage at 4%. The club decided to accept this offer. Finance would be needed beyond what might be raised by the fund-raising committee and the club decided, after much debate, to appeal to members for interest-free loans. Three trustees were appointed to satisfy the legal requirements relating to the purchase, these being Messrs. Drew, Woodbridge and Coombes. Mr. Drew also took office as Assistant Secretary to help with the additional secretarial duties arising from the purchase. So the club now had a piece of ground, conveniently situated, and could go ahead with the plans it had had in mind since 1938, to construct its own green and provide other necessary facilities, such as a pavilion, bar, toilets, and changing rooms. This concludes the history of the first part of the club’s history from its foundation in 1936 to the acquisition of the new site in 1949. Is is clear that during this period most of the club members were prepared to make the best of the conditions, in particular, the nature and state of the green, for the sake of playing the game of bowls and enjoying the company of fellow bowlers.